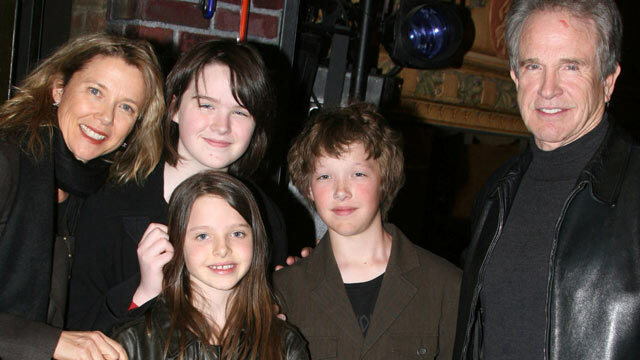 Annette Bening (left), Warren Beatty (right) with children Kathlyn, Benjamin and Isabel, visit "Spring Awakening", New York, NY, April 6, 2007. In a war of words in the struggle to "demolish transphobia," 20-year-old Stephen Ira Beatty has blasted "Dancing with the Stars" contestant Chaz Bono, calling the transgender son of Cher a "a misogynist who does not represent us." Beatty describes himself in his blog as "a gay trans man for whom both identities are important." He is also the son of Hollywood actors Annette Bening and Warren Beatty. Born Kathlyn, he is the oldest of the couple's four children. His mother played the lesbian mom "Nic" in the award-winning 2010 movie, "The Kids Are Alright." The film depicts two teens struggling with their identities. His father, the Oscar-winning director of "Reds," was a longtime Hollywood lothario before setting down and marrying Bening. Stephen Ira Beatty slams Bono for saying that transgenderism is "a birth defect, like a cleft palate," and that "being male and having breasts is about the worst thing I could imagine." He attacks Bono for saying, "I never understood women before . . . but I had a tolerance for women that I don't have now . . . There is something in testosterone that makes talking and gossiping really grating." Beatty, who says he has undergone hormonal treatment, responded, "I don't want any rich white trans guy . . . telling the media that testosterone made him a misogynist . . . he has some deep-seated misogyny to work through." Bono's publicist declined to comment. Beatty did not respond to an email. Bono, 42, underwent gender reassignment from 2008 to 2010, legally changing his name from Chastity to Chaz on May 7. In October, he was honored with a "Respect" award from the Gay, Lesbian & Straight Education Network (GLSEN) for being a role model for teens. In a second post after the initial one got press attention, Beatty says that he holds no "ill will" against Bono, admitting he was once guilty of making insensitive comments. "I just don't want anyone thinking that he's qualified to offer Trans 101, you know?" he said. Beatty also complains in his blog that Sarah Lawrence College, where he is a sophomore, has refused to accept his chosen name. He said he "refuses to be treated as a logistical problem." According to the school directory, he is listed as Kathlyn E. Beatty. Beatty's blog, "Super Mattachine," refers to the Mattachine Society, one of the first gay rights groups founded by Harry Hay in 1948. There, in the "About" section, he says he is an activist and writer -- "a white anti-racist, a feminist, and a poet." He also writes for the the school's alternative publication SLCSpeaks and has appeared in the school's poetry festival and cabaret. Just north of New York City, Sarah Lawrence College is a small liberal arts school known for its commitment to acceptance and to fostering a community of diversity. Ella Riley-Adams, a writer from Ashland, Ore., and a classmate of Beatty, said the community's strength is also its greatest weakness and she is sympathetic to Beatty's point of view. "We have that idea that is open and everything is welcome, so much so that we are sort blind to the issues that do arise, and think, 'someone else is dealing with it,'" said Riley-Adams, 20. "Sarah Lawrence still has work to do, less work than a lot of other places, but there is progress to be made nonetheless." She said she wanted to organize a "more well-rounded group of students expressing their opinions, and immediately thought of Stephen because [she] knew how articulate he is and that he has opinions about lots of things, mainly transgender topics and how to address them with an open mind and the right vocabulary." Riley-Adams said Beatty's writing had already attracted the attention of Glamour magazine. Beatty's gender transition has reportedly been difficult because his parents are one of the most high-profile couples in Hollywood, a former high school friend told ABCNews.com last year, when tabloid reports first emerged that he was transitioning. "He wants to live his life and be Stephen, and he is Stephen," said friend Sam Schiffer, who graduated with Beatty in June from Arete Preparatory Academy. "If he were born Kathryn O'Brien or Smith, it would not be as insane as is." "Stephen is absolutely the most brilliant person I have met in my whole life," said Schiffer, the son of screenwriter Michael Schiffer ["Lean on Me," 1989, and "Crimson Tide,"1995]. "He is unimaginably smart and that comes from his mom and dad, who are smart people." "He's publicly out as a gay man and trans to everyone who knows him personally," he said. "He has certain ideas especially that people have gender roles and how people should be and what society dictates, and he goes against that." The Beattys have three other children: Benjamin, 16; Isabel, 14; and Ella, 11. They attend Buckley, the Sherman Oaks private school where Stephen had a particularly hard time until he transferred to the more accepting Arete Preparatory Academy in Los Angeles, according to Schiffer. Buckley is a traditional school that caters to more of the "Beverly Hills 90210" crowd, according to his friend. Celebrity children like Kimberly Stewart, daughter of Rod, and Paris and Nicky Hilton are alumni. Arete caters to gifted children and those who don't fit into a conventional setting, he said. During his high school years, Beatty's classmates supported him "150 percent," said Schiffer, but he still had some social issues. "The hardest thing that I observed was getting people to accept him for who he is," Schiffer said. Transgender youth face high levels of victimization in school, even more so than their lesbian, gay and bisexual peers, according to recent studies. "It's been really rough for him -- not just [at] Buckley, but having a family that much in the limelight," Schiffer said. "His father is Warren Beatty. The National Enquirer said his dad was furious with him. No. His dad is a really supporting guy. But his dad comes from a different time and it's hard to grasp a daughter not being a daughter anymore, but a son. "He loves Stephen and has not threatened to kick him out of the house," said Schiffer. "They've had their problems, but he's a good guy." In Chaz Bono's book, "Family Outing," he reported that his gay-icon mother was "'uncomfortable" with his sexuality and went "ballistic" before finally accepting him. Transgender youth, in particular, are at disproportionate risk for depression, suicide, substance abuse, HIV and sexually transmitted diseases, according to the Family Acceptance Project. Their study revealed that lesbian, gay, bisexual and transgender children have happier and less risky lives when parents support them, according to Caitlin Ryan, a clinical social work and director of the project. GLSEN Director of Communications Daryl Presgraves said the fact that Beatty is the son of famous parents offers "hope to other youth." "It's extremely important to be able to identify with a celebrity and see someone like them," he said. "When you are a young person and you see someone like Chaz Bono and the Bening-Beatty son publicly identify as transgender, it makes it so much easier to realize that [it's] not something that has to be so isolating -- there are people out there like you," said Presgraves. "That kind of visibility offers hope to transgender or gender nonconforming young people and encourages them to live openly and honestly." "For young people, visibility of other transgender people provides a hopeful prospect that they too can live an authentic life and be afforded the kind of respect and equality that everyone deserves in our society." Freelance writer Courtney L. Sexton contributed to this report.